Please note that all information posted is subject to our disclaimer. Persons having business before the court should not rely on the information presented here, but should instead rely solely on printed notices received in the mail. Whenever the information contained in these pages conflicts with a printed notice, the printed notice controls. 6) Efficiently and effectively dispose of all cases on the State Court’s civil and criminal dockets in a timely manner and in accordance with law. The State Court of Fayette County was created in 1994 by local legislation of the Georgia General Assembly (Ga. L. 1994, p. 4980). State Court began operating on January 1, 1997. The Honorable W. Fletcher Sams served as judge from 1997 through October 4, 2010. Judge Sams was succeeded by the Honorable Carla Wong McMillian until her appointment to the Georgia Court of Appeals. 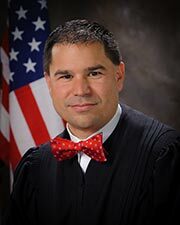 The Honorable Jason B. Thompson was appointed as State Court Judge of Fayette County by Governor Nathan Deal in April, 2013, and sworn in on May 22, 2013. State Court is a court of limited jurisdiction. State Court has jurisdiction, within the territorial limits of the county, over all criminal matters below the grade of felony, including misdemeanors, traffic violations, and county ordinance violations. State Court has jurisdiction over all civil matters, without regard to the amount in controversy, concurrent with the Superior Courts, unless the Superior Courts have exclusive jurisdiction (i.e. disputes concerning title to land, divorce, child custody, etc.). The State Court also has jurisdiction over the review of decisions of other courts as provided by law. Criminal violations handled in State Court are prosecuted by the Office of the Solicitor General . If you are scheduled to appear in State Court at a certain date and time, it is very important that you appear promptly at the time shown on the notice you receive in the mail. You should plan to arrive sufficiently early to avoid serious adverse consequences which may result from your absence. You should dress in a manner appropriate for your appearance in court. If you have children, and if possible, you should make arrangements for their care well in advance of your court date so that they do not disrupt court proceedings. Cell phones, pagers, and other devices that may disrupt court proceedings are not allowed in the courtroom, except that members of the bar and court personnel may use electronic devices such as laptops so long as such use does not disrupt court proceedings. In the event of inclement weather, the State Court follows the policy for Fayette County Government offices. Any missed hearings will be re-scheduled with notice to the parties. The Court cannot appoint attorneys to represent parties in civil matters (private disputes between two or more parties), nor may courthouse personnel recommend attorneys. Courthouse personnel are legally and ethically prohibited from giving legal advice. You may wish to contact the local bar association in the county where you are located for an attorney referral. In Fayette County, you may contact the Fayette County Bar Association. If you cannot afford an attorney, you may wish to contact the Atlanta Legal Aid Society. Any party desiring to have a hearing reported in State Court shall notify the Court's Judicial Assistant Toni Sarr Tumlin at least two full business days in advance of the hearing. State Court is open Monday through Friday, 8:00 a.m. to 5:00 p.m., except for those dates designated as legal holidays in Fayette County. 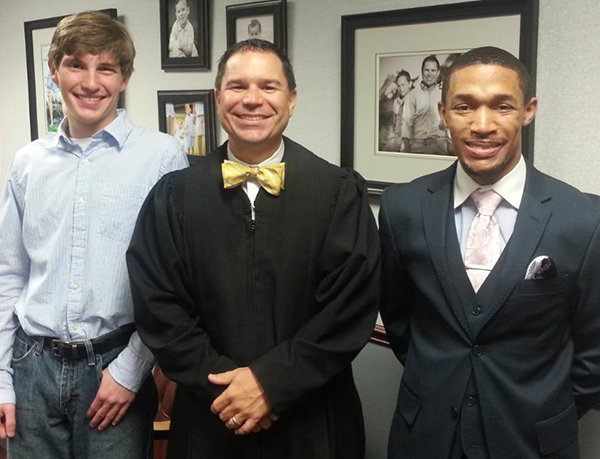 Since taking office, Judge Thompson has made it a priority to work with the students in Fayette County. In addition to visiting our local schools and offering internships, Judge Thompson has developed a program allowing for local high school, college, and law students to shadow him in State Court. If you know of a student interested in law, criminal justice, or law enforcement that would like to be Judge Thompson's guest and shadow him in court, please contact the Toni Tumlin (ttumlin@fayettecountyga.gov) for more information. The Law Library is open to the public Monday through Friday, 8:00 a.m. to 5:00 p.m., except for those dates designated as legal holidays in Fayette County. Monday: 7:00 a.m. - noon; 2:00 p.m. - 4:00 p.m.
Tuesday/Thursday: 9:00 a.m. – noon; 1:00 p.m. – 5:00 p.m.
Wednesday/Friday:9:00 a.m. – noon; 2:00 p.m. – 6:00 p.m. The office may be closed when the probation officers are in Court.